Principal Mike Odiotti with students and faculty at the ribbon cutting one year ago. 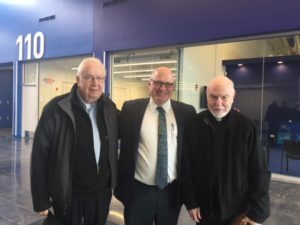 faculty alike at Cristo Rey St. Martin College Prep, who realized — today — that they have been in their long-awaited new building for one year already. 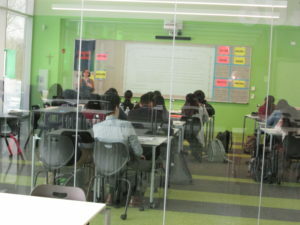 Each classroom is equipped with SMART Board technology and is enclosed in glass. Students realized the significance of moving into a modern, state-of-the-art building, right from the start. 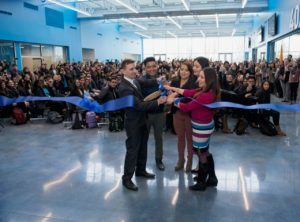 “This new building really represents who we are: hard working, dedicated, professional students and staff,” said Tamara Sanchez, ’18. President Preston Kendall, center, acknowledges the role of the Viatorians, including Fr. Charles Bolser, left, and Fr. John Milton, right. 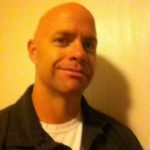 Viatorians have supported the school since it opened in 2004, and they continue to stay involved, including Fr. Charles Bolser, CSV, a former president; Fr. John Milton, CSV, a science consultant; and Associate Jim Thomas, who serves on its board of trustees. The move one year ago, took the school from the former St. Joseph Parish, a former grade school on a two-acre property comprised of less than 30,000 square feet on the south side of Waukegan, to a repurposed K-Mart building, on the city’s west side. CRSM is part of a national network of 32 schools dedicated to the Cristo Rey mission. It blends a rigorous academic education with significant work experience through its Corporate Work Study Program. This fall, Viatorians will open one of the newest schools in the network, Cristo Rey St. Viator Las Vegas.